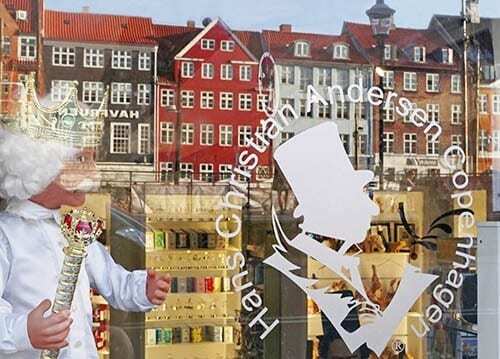 Nyhavn buildings reflecting in window of shop named for Hans Christian Andersen. ABOARD THE EURODAM – Back at our home port. In the 1952 internationally successful musical, Danny Kaye in his role as the famous Danish poet and fairytale writer Hans Christian Andersen sings this ode to this wonderful 600-year old national capital of Denmark famed for its charming small town atmosphere. 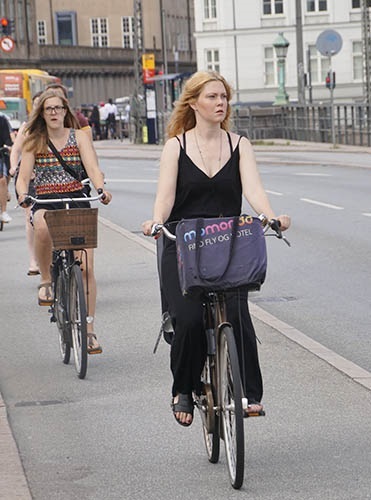 Experiencing Copenhagen like a local means riding a bicycle. Despite it’s title as “The City of Bicycles,” walkers will find this cozy city of grand architecture amid plentiful parks, lakes, and canals safe and friendly and accessible to exploring on foot. Just don’t walk in the bicycle lanes or some of the “happiest people in the world” will probably become mighty unhappy. 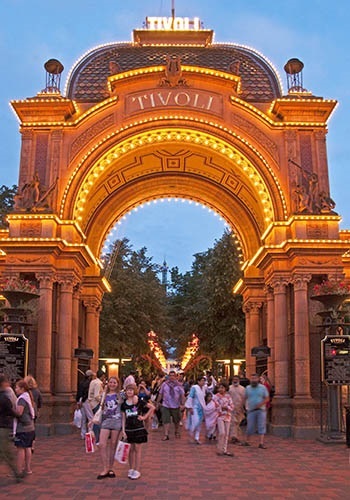 While the old standby tourist attractions of Tivoli Gardens, the Little Mermaid, Amalienborg and Christiansborg Palaces, Rosenborg Castle, canal tours, and the classic buildings of the historic core are not to be missed by first-time visitors, the city’s modern-day culture and deliciously plentiful culinary options await newcomers as well. To get your cultural bearings, begin with a stroll down the main shopping street, Strøget, one of Europe’s longest pedestrian streets featuring a wealth of design shops and international flagship stores. 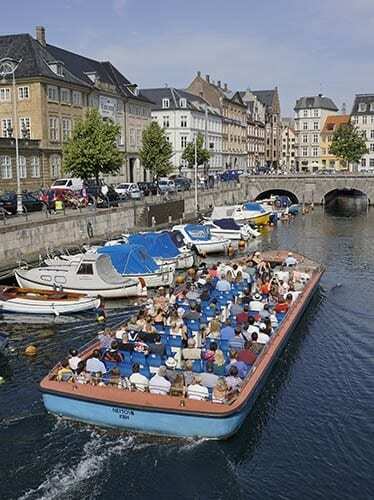 A canal cruise is a pleasant way to see Copenhagen. Deservedly famous for minimalist, functional, and affordable Scandinavian design, Copenhagen is currently being touted as a rising center of European fashion. The city features a bevy of contemporary designer labels receiving international recognition including such names as Marie Ganni, Mads Nørgaard, Wood Wood, and the cool Scandinavian minimalism of the affordable Samsøe & Samsøe. 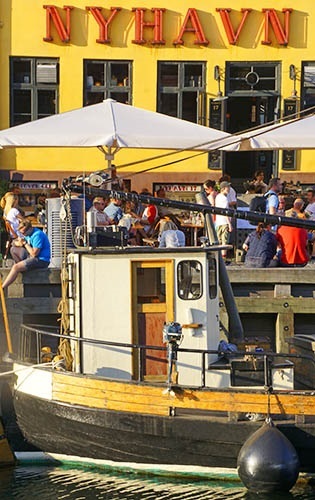 For a small city, Copenhagen is packed with food traditions. So at lunchtime, a frugal snack would be to seek out a corner shop for a sampling of smørrebrød, the open-faced sandwiches that are a staple of the Danish diet. Or, if you choose, you can head over to touristy Nyhavn for an overpriced lunch. Possibly you will even find it to be worth the expense, if only as a way to soak in some of the local waterfront dining atmosphere. 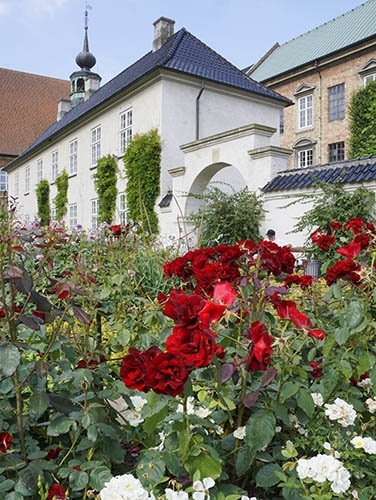 Copenhagen is a city of beautiful architecture enhanced by colorful gardens. Sampling Copenhagen culture might also include visits to some of the city’s museums. As mentioned before in discussing the Vikings, the National Museum of Denmark covers the history of Denmark from pre-historic times. Nearby, the Glyptotek is an unusually named museum on the edge of Tivoli Gardens created by its founder, Carl Jacobson of Carlsberg Beer. Inspired by the original Glyptotek in Munich, Jacobson envisioned a grand museum to be built in central Copenhagen to house his extensive personal art collection that he donated to the Danish government. In addition to the expected impressionist and post-impressionist European paintings, extensive works from Ancient Egypt through early Roman times are presented in the collection. The Royal Museum of Fine Arts, the biggest museum in Denmark, exhibits works from the 13th century to the present. Rubens, Rembrandts, and twenty works by Matisse are featured. Other notable museums include the Carlsberg Museum established in 1882, the Copenhagen Amber Museum displaying the largest chunk of amber in the world, and the Danish Jewish Museum, designed by Polish-American architect Daniel Libeskind. Boat anchored at dock in Nyhavn. And last, but not least, is the Hans Christian Andersen Museum opened in 2005 to honor the beloved Dane’s 200th birthday. I expect Danny Kaye would have loved it. Also, since I learned so much about Vikings on this assignment, I probably should thank the Viking god of weather, Thor, for the nearly perfect days of the past two weeks since he made my prediction of gliding on a calm Baltic Sea come to pass. Now if Thor could have only made the painfully slow and overpriced internet on the ship work better. I suspect he had better communications with those Vikings on their longboats.